Measuring tasks in the glass industry are often a huge challenge for sensors. The new confocal chromatic confocalDT 2421 / 2422 controllers ensure reliable, high speed and high precision distance and thickness measurements on reflecting and transparent objects. The confocal chromatic sensor product range from Micro-Epsilon is extended with the compact IFS2406-3 sensor. It can be used in restricted spaces and provides precise measurement values with a large offset distance. The innovative confocalDT confocal chromatic measurement system includes a controller and a sensor connected via a fiber optic cable. 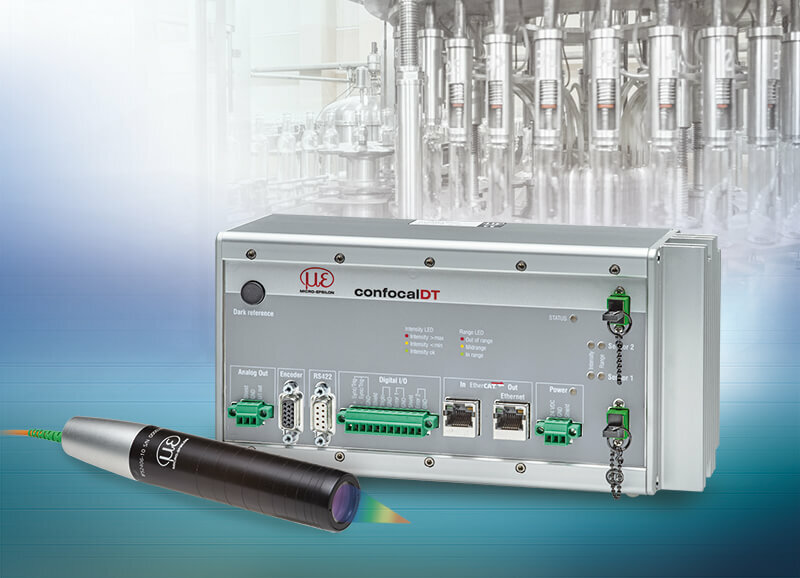 The new confocalDT 2421 and 2422 from Micro-Epsilon set new industrial standards in precise, confocal measurement technology. Available as either a single- or a dual-channel version, these measurement systems enable a low cost solution especially for high volume applications. These controllers show off their strengths especially in the glass industry where high throughput rates are required. Therefore, it is possible to perform multi-track measurements on flat glass, two-sided thickness measurements and multipoint thickness measurements on container glass using only a single controller. Furthermore, they are used in production control and quality assurance of smartphones and tablets. Data is output in real time via an EtherCAT interface.The thickness calibration feature enables precise thickness measurements across the entire measuring range of the sensor. The measurement process is non-contact, wear-free and almost independent of surface properties. Furthermore, the confocal chromatic sensor range from Micro-Epsilon is complemented by a new sensor model. The IFS2406-3 enables precise displacement and distance measurements in restricted spaces with a large offset distance, which means it is ideally suited to applications in the glass industry. Due to the offset distance of 74mm and a measuring range of 3mm, it is particularly useful when increased process reliability and protection of sensor and target against mechanical damage are required. Extremely small objects can be detected due to the extremely small measurement spot size. The confocal chromatic measuring technique enables multi-layer thickness measurements of transparent materials, distance measurements, intensity evaluation and measurements within recesses and boreholes. For example in container glass production, wall thickness and roundness of the bottles are crucial quality features. This is why these parameters must be 100 % inspected. Due to high processing speeds and in order to prevent the bottles from being damaged, a fast, non-contact measurement procedure is required. Automatic exposure control allows stable measurements regardless of the glass color of the container glass.